The Dingos have dropped to 1-2 with a one goal loss to the Grand River Gargoyles in blustery conditions in Guelph on the weekend. In a match where both teams were short on numbers, the Dingos fell to the Gargoyles in an arm-wrestle of a game that saw several lead changes before Grand River ultimately emerged victorious. Tom Bell was dominant in the ruck, while captain Rob McNaughton worked hard up front to kick four goals. Veteran Dave Wells worked as a swingman, playing behind the ball when the Dingos were kicking against the wind and moving up forward to snag two goals when the Dingos had the advantage. Highlight of the day went to Pat Bossey, who took a strong mark outside fifty before playing on, shrugging a tackle and bombing a long goal. The goal capped off a great game for Bossey, who got a lot of the ball through the midfield in one of his best games for the club. The Dingos will be lamenting missed opportunities after letting a winnable game slip. 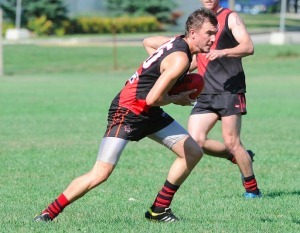 Well done to new Dingo Dane Roberts on his first game in the red and black. The club will be looking to give him his first win on Saturday morning against the Toronto Eagles at Humber.